Quentin, an artist, began gardening as a creative outlet and a nurturing activity and soon became interested in organic, permaculture and bio-dynamic methods. I attended a compost making course at KEAG, Kommetjie, and was hooked on compost making. I moved from Cape Town to Stanford with my family and worm culture/compost. In 2003/04, I began my worm farm and simultaneously worked in the vegetable garden at Camphill, Hermanus. Marketing of vermiculture products such as leachate, vermicompost, red wrigglers and castings. Providing basic training in sustainable organic cultivation methods for vegetable and home gardening. Selling plants from my nursery and propagating plants for my projects. Eisenia Fetida are commonly known as red wrigglers or compost worms. Wrigglers are epigeic living at the interface of the soil and deposits of decaying plant matter and animal residues. Earthworms constantly recycle natural and organic waste. Earthworms excrete castings enhanced with growth hormones and beneficial soil bacteria improving soil structure, fertility and productivity. Earthworms oxygenate , increase the organic matter and sequester carbon dioxide in the soil. 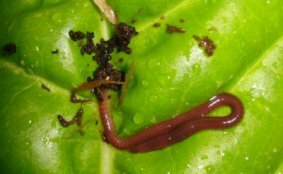 Earthworm Organics is a project for earthworm farming and farming with worms.